The Hop-In Centre has been named after and in memory of Major Albert Moore and has been attached to the Red Shield Defence Services within the Australian Defence Force. Here is a following article capturing pictures and interviews of selected personnel and Representative Albert Moore at Kokoda. This is a place that is often called ‘my second home’. You can come and relax here during your down time. There are movies to watch, all sorts of games to play, books to read, or catch a few zzzzzzzzzz’s during lunch or well-earned break. 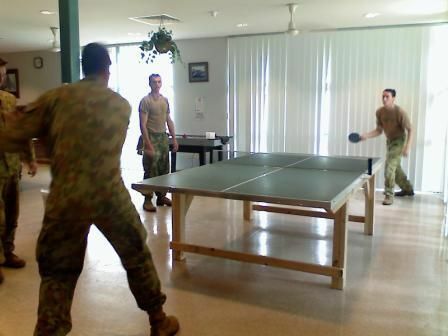 The relaxed atmosphere is felt throughout the building - with laughter around the game consoles (2 Wii consoles, a PS2 and 3 large screen plasma tv’s), ‘fierce’ rivalry at the table tennis table, and the endless chatter of mates sorting out the troubles of the world, giving each other a ribbing, or just passing the time of day. Maybe you would like a bit of peace and quiet. Down the corridor is the library and sitting area. You can read a book, peruse a magazine, play a game of chess or try your hand at scrabble. Our building is large enough to cater for all these activities without interrupting your quiet time. If you are going out bush for a time, why not come in and borrow a book? When you’re done, you can bring it back and swap it for another. We are happy to receive donations of books so if you have a few at home that you have read and would like to pass on to others, please feel free to drop them in. We’ll gladly take them off your hands and add them to our collection. To top it off, we have a brew room complete with microwave and hot water ‘on tap’ for that much needed coffee or tea and biscuits, and a fridge filled with soft drinks, chips and choc’s for those who need that sugar fix. Games Room 2 full size pool tables. 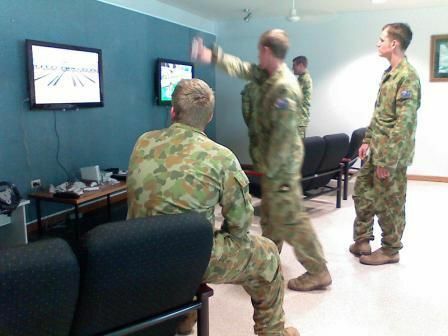 Table tennis, Game Consoles – Wii, PS2, PS1 – with 3 x 42” plasma tv’s, Air Hockey, Table Soccer. Library Magazines, Comics, books – fact and fiction, Table Games. with removable wall to double the space if needed. Out Field with The "Sallyman"
The "Sallyman" catching up with members of the 1st Combat Engineering Regiment at Cultana Training Area in South Australia. The Dogs are Explosive Detection Dogs (EDD). Whilst training as bomb sniffers, they too join the troops for a well earned break around the "Sallyman's" Truck. The "Sallyman" fords a creek at the High Range Training Area near Townsville in Queensland to deliver much enjoyed refreshments to those training. A M113 APC watches and waits as the "Sallyman" crosses the river. It is not uncommon for the "Sallyman" to be escorted to the different locations during exercises. Soldiers from the 1st Armoured Regiment & 1st Combat Support Supply Battalion partake in a break from training, enjoying a refreshing drink and a chat. Where ever the "Sallyman" is troops will soon gather. There is nowhere to hide. The "Sallyman" with members of 5 RAR at Cultana Field Training Area in South Australia. The soldiers really appreciate a hot or cold beverage from the "Sallyman" to sooth a parched dry throat and wash some of that red bull dust down.